This is the sequel to "Power of the Dog" set several years in the future. It covers a a ten year period with a DEA agent ,Art Keller, attempting to track down a Mexican drug cartel boss, Adan Barrera. Firstly, the book is about 200 pages too long, we have a characters introduced and disposed of for no other reason than to have a grisly death. The second problem I have with the book is the grisly deaths. I know that these cartels specialize in spectacularly horrid deaths for those they want to dispose of but it seems at times every third page describes a beheading, de-limbing or disembowelment. After the first three hundred beheadings they lose their shock value, take up space and appear as padding. 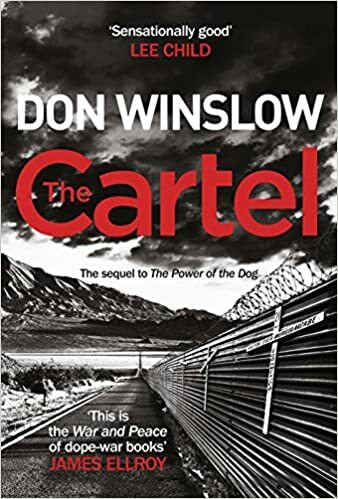 The book highlights the corruption that is rife in Mexico and Central America that allows these cartels to flourish, when you have police earning $100 per month and they're offered $10,000 to look away its understandable. Winslow can write much better than this,( Savages, The Winter of Frankie Machine) the book feels dictated. His novels are starting to be made into films which again makes me think this has a film or TV series payday in mind. If this had been edited tighter and the rather weak ending tidied up it would have been much more satisfying.